Wiebe primarily takes issue with the way that my book incorporates perspectives from the history of science. Putting scientists on a level historical playing field with other spokespersons that make claims to “knowledge”, such as theologians, philosophers, and – horrible dictu – occultists, may seem to relativize the epistemic claims of scientists. Thus, Wiebe is led to conclude that my approach threatens to corrode the authority of the sciences, and with it the distinction between the scientific study of religion and the claims of religious spokespersons (p. 4-5). Two simple clarifications will, I hope, suffice to demonstrate that these fears are unjustified. First, Wiebe’s review seems to lack a clear distinction between the historical task of historicizing epistemic claims and the philosophical task of doing normative epistemology (such as demarcating science from non- or pseudo-science). I am doing the former, not the latter. I analyze (some) scientists as historical actors, which inevitably means viewing their normative claims with regard to the proper conduct of science as contingent historical expressions. However, a historical description and comparison of diverging claims is not an “attack” on the “special epistemic status” of the sciences. Descriptions of what actually happened and judgments on how it ought to have happened are simply separate issues. Even though my primary agenda was historical, it might be worth noting that the book does, in fact, also include a thorough discussion of epistemological issues (e.g., in chapter two – an earlier version of which is freely available here). It even features a critique of the sort of “radical constructionism” with which Wiebe appears to have me associated. Unfortunately, the review did not engage with this dimension of the book. The second clarification concerns my motivation for including the history of science in the first place. There is a very simple reason for it: As I demonstrated in chapters two and four of the book [see here and here for free dissertation versions of these chapters], non-experts in the history of science who write about the historical relationship between science and religion frequently end up reproducing “emic historiographies of science” – “history myths” that serve various insider agendas, but are simply not supported by rigorous historical research (I wrote about this on Heterodoxology many years ago). Being able to clearly “differentiate between strategic mythmaking and actual scientific practice” (Problem of Disenchantment, 100-101) was my primary motivation for engaging with the history of science literature, as expressed on numerous occasions throughout the book (e.g., pp. 61, 89, 100-106, 110, 120, 125-127, 139, 141-143, 147, 278, etc.). As a general principle, I hold that researchers seeking to make valid scholarly claims in an interdisciplinary space have an obligation to read up on relevant specialist literatures – whether history of science, economics, psychology, or whatever field one’s research enters into (see e.g. pp. 84-85, 556-556). In the book, I called this stance the “endoxic principle” (pp. 84-86). Engaging with history of science in a work of religious studies is simply a special case of its application. Pace Wiebe’s complaints, I believe this to be a principled and staunch defense of the epistemic authority of academic expert systems rather than an attack on it. Those curious about my view on consilience between the harder sciences (especially cognitive science and psychology) and the humanities (esp. religious studies) should check out “Reverse-Engineering ‘Esotericism’: How to Prepare a Complex Cultural Concept for the Cognitive Science of Religion” (Religion, online 22 Sept 2015, doi: 10.1080/0048721X.2015.1072589) [from publisher, paywall]. And, of course: it doesn’t hurt to read the book for yourself. 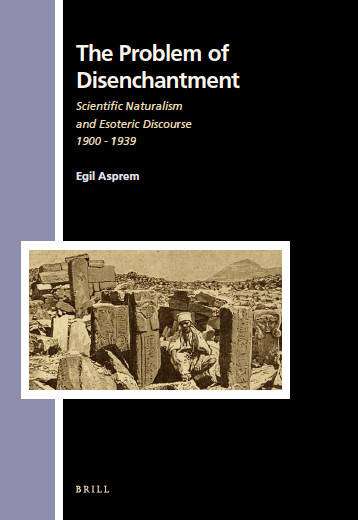 The dissertation on which it is based is now available electronically from the University of Amsterdam’s repository. Please note that crucial parts, especially chapters 1, 2, and the conclusion, have been thoroughly rewritten in the book version.